Low-pressure, extra-soft foam for comfort and fit. Shaped to fit even very small ear canals. Independently tested to ANSI S3.19-1974. Noise Reduction Rating, NRR 33. 100% PVC-free. 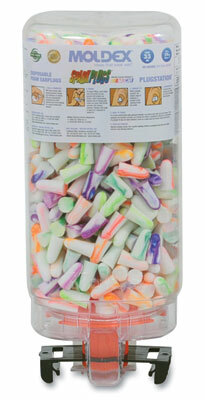 PlugStation dispensers contain 500 pairs of loose earplugs and dispense them into the palm of your hand with one-turn. Mounting bracket and hardware included.